Digitizing TCI’s archival heritage collections. Although occupied for more than 300 years, the Turks & Caicos Islands have been historically governed from afar. This absence of direct governance has resulted in limited archival conservation measures, leaving tens of thousands of rare documents in peril. While the Turks & Caicos National Museum (TCNM) has made attempts to identify and stabilize these documents, the absence of funding and conservation consultation resulted in digitization of only one file—until recently. During the past two years, efforts have been made to digitize the most vulnerable and essential documents in this collection. The digitization and dissemination of these archives will provide researchers with new insight into these rare documents. During the 17th and 18th centuries, the Turks & Caicos Islands were occupied by French, Spanish and English settlers, with limited permanent settlements and virtually no direct governance. It wasn’t until the late 18th century that British Loyalists, with substantial numbers of slaves, began to arrive and establish settlements throughout the Islands. Given the country’s isolation and absence of a centralized government during this time, rapidly deteriorating archival materials are crucial to our understanding of this period in the colonial history of the region. Often referred to as “outlying islands,” archival material from the TCI is scant, at best. The absence of a central government repository, natural disasters and neglect has resulted in the loss of thousands of rare documents. Many of these documents, such as personal correspondences, registers of births, baptisms, burials, land grants, etc., can provide a great deal of insight into the lives of those who were marginalized and enslaved in this outpost of the Caribbean. The digitization of these materials provides academicians, officials and members of the community with the opportunity to explore the histories of those who have often been excluded from mainstream publications. A 1983 survey of colonial archives inventoried 2,000 titles, representing thousands of records. Shortly thereafter these records were separated and placed in various buildings throughout Grand Turk. During this time the vast majority of those records were damaged beyond recovery. 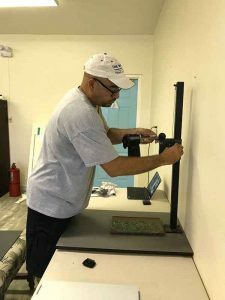 Through the efforts of the TCNM—the only institution in the Turks & Caicos Islands with a mandate to collect and curate historical and cultural records—nearly 50 linear feet were obtained (more than 50,000 documents). In 2010 an EAP 408–Pilot Project, “From the brink: Identifying, collecting and digitizing records of the Turks and Caicos Islands after the destruction of Hurricane Ike,” surveyed and identified documents in the TCNM archives, other government offices, churches and private collections. Additional items were rescued from a structurally unsound building, treated with UV, vacuumed, stabilized and catalogued into the Museum. Only one item was digitized under this pilot project, leaving the remaining originals vulnerable to loss though natural disaster or simple ongoing deterioration. 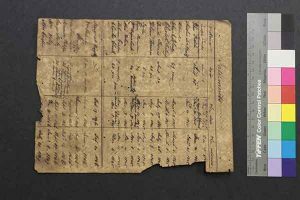 Without a digital record, damage to or destruction of these documents would represent a major loss of the cultural history of the Islands. This is an example of a single scanned document in the Museum’s project to digitize the TCI’s archival heritage collections. In 2016, the Zemi Foundation was awarded a British Library Endangered Archives Grant to digitize various documents held by the TCNM. The Endangered Archives Programme (EAP) was established in 2004 to digitize and make available to all, archival materials that are endangered, damaged or at risk of destruction. Since that time, millions of rare and endangered documents have been scanned throughout the world and are now available to all, free and online. This grant provided the National Museum with a venue to identify and digitize documents that were in peril. The aim of the work supported by this grant was to digitize archival collections held by the TCNM. This included collections previously identified by EAP 408. An additional aim was to raise awareness of the importance of protecting historic documents and convey the significance of the development of a National Archives in the Turks & Caicos Islands. During the course of 24 months, staff from the Zemi Foundation and the TCNM, along with university interns and local volunteers, worked to digitize more than 15,000 documents. Training sessions were held for government officials, museum staff and various members of the community. The process of digitization was long and arduous. Staff and volunteers worked around the clock to ensure that documents most imperiled were identified and documented with the utmost of care. The documents digitized included birth, death and baptismal records from the Anglican and Methodist Churches, along with various government correspondences (detailed below). The digitization of these documents was crucial as many had disintegrated so much that they could not be handled. Dr. Michael Pateman establishes a digitization station in the Museum Science Building. Turks & Caicos residents from as far as Providenciales assisted in the digitization process. Volunteers included Hon. Josephine Connolly and the recently deceased Lawrence Ben. Word quickly spread of the digitization project and various members of the community visited the museum to assess our efforts. Reverend Archbold from the Salem Baptist Church on Grand Turk asked the team to conduct a preliminary assessment of rare and endangered documents held by the church. Documents were assessed, digitized and stabilized to provide parishioners with the opportunity to see, firsthand, how the conservation process worked. We soon discovered that thousands of documents are currently housed with various organizations and individuals throughout the country seeking a venue to preserve them. Unfortunately, limited funding did not allow the team to digitize most of these documents. Therefore, training and community inclusionary measures played an integral role throughout the digitization process. Members of staff, board of directors, local volunteers (including politicians such as the former Deputy Speaker of the House of Assembly, the leader of the Opposition [who later became the Premier] and other Members of Parliament) participated in digitization activities. No organization is totally immune from disasters, either by human action or the forces of nature. Disasters like earthquakes, tornadoes, hurricanes, floods and fires are world-wide occurrences. Many organizations assume they will never experience a disaster, so they never develop a strategy for preventing or responding to one. 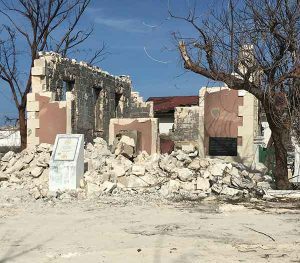 This photo of the venerable Victoria Public Library on Grand Turk vividly depicts the dual effects of a major fire and Hurricane Irma in 2017. A burst pipe, an electrical fire, pest infestation, mold, improper storage or vandalism can wreak havoc in archives, damaging or destroying records that are irreplaceable. As seen recently in the Turks & Caicos, hurricanes and fires can bring devastation to these rare and endangered assets. During the course of this project, three natural disasters affected the TCI’s historic records. On March 9, 2017, a fire devastated the historic Victoria Public Library, destroying all material held there, including non-digitized historic documents. On September 7 and 14, 2017, Hurricanes Irma and Maria rampaged through the Turks & Caicos Islands. While none of the historic collections at the Museum were lost, they were impacted as a result of no power at the TCNM Archives for six weeks. Most at risk for residents, government, businesses and for archives are records that document individual and collective memories, leading to “identity loss.” Following a hurricane, secondary threats become evident. Emergency power failures or electrical faults, leaks or drainage problems or mishandling and human error can all put these documents at risk. Imperiled records on the Turks & Caicos Islands such as property deeds, birth certificates and personal papers, as well as records documenting rights and entitlements—such as National Health Insurance and its benefits—are all crucial to individuals and institutions throughout the county. While the digitization of 15,000 documents may seem like a lot, we have only begun to scratch the surface. Hundreds of thousands of rare and endangered documents can still be found throughout the country. The National Museum is undergoing a comprehensive reorganization under the direction of the new director, Dr. Michael Pateman. These efforts include an expansion of the library and the establishment of an on-site volunteer digitization station. Given recent events, the importance of the digitization of rare and endangered documents cannot be understated. We hope that in the near future, a National Archives can be established to ensure that these rare and endangered documents are digitized and preserved for generations to come. A National Archives can help connect families by providing a resource for personal research and family history discovery. For decades, even centuries, national governments have gathered data that has substantive value to researchers trying to improve quality of life. National archival records have helped researchers and reformers tackle topics as diverse as welfare, epidemiology, criminal justice, educational reform, migration and immigration and environmental affairs, to name just a few. The school system can use digitized resources from National Archives collections as educational resources for their classes. There are limited details about this region in history books. A National Archives encourages students to delve into the professional papers of the Islands’ political and civic leaders to find details about events or people. The students who conduct research into the primary documents of an island’s history begin asking more questions about both history and current issues. We would like to recognize the efforts of the following individuals and organizations who helped make this digitization happen: The British Library Endangered Archives Programme, the staff and volunteers of the Zemi Foundation, the Turks & Caicos National Museum staff and volunteers, interns Alex Temple and Vanessa Forbes-Pateman and Premier Sharlene Cartwright-Robinson.